A moist almond cake with excellent keeping qualities that makes a delicious alternative to the traditional simnel cake. Cream together the butter and sugar until light and fluffy. Gradually add the eggs, beating well after each addition. Fold in the flour and ground almonds. Stir in the chocolate flakes. Spoon the mixture into a greased and lined 18cm square cake tin. Level off the top of the cake mixture. Place in a preheated oven on the centre shelf at 150ºC, gas mark 2 for 2 hours or until a wooden skewer or a small knife inserted into the cake comes out clean. Leave for 10 minutes, then remove from the tin and place on a rack to cool. To decorate the cake Brush the surface of the cake with a thin layer of apricot jam. Place the cake on a cakeboard. Dust the work surface with icing sugar first to avoid sticking, then roll out 700g of the Inspirations White Icing into a 30cm square, 4-5mm thick and use to cover the cake, taking care not to stretch the icing over the corners. Trim it away neatly around the base. To make the icing rope, clear your work surface of all icing sugar. Divide 100g of white icing into two, roll each piece into a long sausage shape, then twist them together to form a rope and stick it around the base of the cake. To decorate the top, mix 25g of the green icing with 50g of the white icing to form a pale green colour. Roll it out into a 12cm square and stick to the top of the cake with a little apricot jam. Mark with diagonal lines to form a trellis effect using the back of a knife. Roll out 50g white icing into a long piece 2-3mm thick. Cut out four 15cm long leaf shapes. Stick one on each side of the green square. Mark each section with two lines indented with the back of a knife. 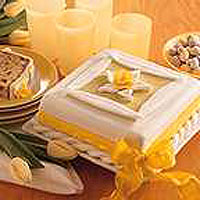 To make the daffodil petals, shape 5 small balls of white icing into a squashed teardrop. Pinch the pointed end slightly. Arrange them overlapping one another with the points directed outwards. Mix all the remaining white icing with the pack of yellow icing. Squash a large ball of yellow icing flat. Frill and thin the edges by rolling them with the end of a paintbrush, using icing sugar to prevent it sticking. Fold this frilled disc in half then half again to form the daffodil centre and place on the back part of the flower. Place the daffodil in the centre of the frame. Leave the cake 24 hours for the surface to dry then position the ribbon around the side and tie a big bow at the front. Use the remaining icing to decorate muffins or biscuits, shape into ducks or make Easter bunnies.